PAYMENTS MUST BE MADE USING eSOFT (AVAILABLE FEB 1ST, 2019). MEMBERSHIP DUES AND SPECIAL ASSESSMENT FEES WILL BE LOADED INTO eSOFT FOR EACH MEMBER. A LATE FEE OF $50 WILL BE APPLIED AFTER MARCH 1st 2019. AUTOMATIC REDEMPTION OF BOND WILL BEGIN ON MARCH 16th, 2019 . NO EXCEPTIONS – NO GRACE PERIOD – WE HAVE A LARGE WAIT LIST. List the Certificate Holder, spouse, and single children living in the same household who will be attending the club this season. If you are eligible for membership and do not sign up, you may not attend the pool, even as a guest. EXAMPLE: If you are a family of four, you will owe $525 for your pool membership this year and $200 for the Special Assessment for a total of $725. The above fees reflect individual dues. Children under the age of one year as of 5/26/2019 are free. Payment of Certificate Holder’s Dues is required to maintain membership in a year when the family does not actively use the pool facilities. Please mail to the following address NO LATER THAN MARCH 1st 2019 . Thank you. A late fee of $50 will be applied after March 1st, 2019. 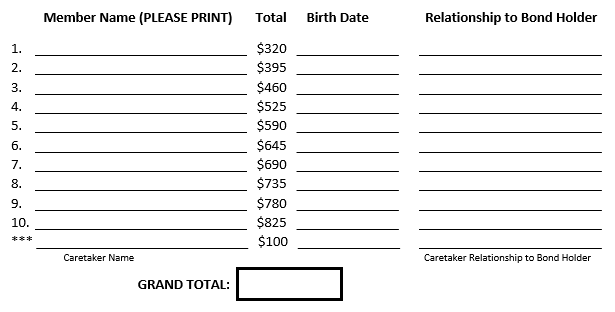 Automatic redemption of bond will begin on March 16th, 2019 no exceptions – no grace period – we have a large wait list! If the child is age 12 or older, has passed the basic swim test and is to be at the pool without parental or caregiver’s supervision, please read and sign below. I give consent for my child to be at the Green Woods Club under the direction and supervision of the staff. I am aware that as a member of the pool (bonded or August only), I will be held responsible for my child’s actions and any damages that may be incurred by my child. I UNDERSTAND IF MY CHILD IS UNRULY, THIS PRIVILEGE MAY BE REVOKED AT THE DISCRETION OF THE POOL MANAGER. I understand that every effort will be made to contact parents/guardians in the event of an emergency. In an emergency requiring medical care and treatment, I hereby authorize any physician, hospital or other healthcare provider to give such care to this child. I also hereby give permission for the transport to/from a doctor and/or hospital by a staff member or ambulance.I do hereby release, discharge, and hold harmless the Green Woods Club Inc., its agents and employees, from any and all liability and claim either we or our child may suffer as a result of these requests for emergency treatment.The undersigned has read this Medical Authorization Consent Form and declares and affirms consent to the contents herein stated.